Sometimes, playing it safe is the scariest thing of all. I felt quintessentially Western, riding my motorcycle down a sizzling black highway, half-shadowed mesas rising up behind a rippling heat wave in the distance. The white clouds that swelled to black and almost kissed the earth finally split to rain just before the Fort Garland turnoff. I hit the gravel shoulder, steadied the bike, pulled a poncho over my head, and clicked the engine back into gear. From then on, it was just the rumble and hum of thunder and road that carried me across the New Mexico border for the first time in my life. And then something I could barely fathom. I was in my 20s and, like a fool, I’d been running that motorcycle open-throttle all the way—until the paved road suddenly turned to dirt. I skidded to a dust-cloud stop. If I’d delayed a second more, I’d have married gravity that day. A few hundred feet in front of me, the earth looked as if it had cracked open into two jagged puzzle pieces, their perfectly matched edges longing to embrace again. The ground leading up to the rift was not a terrace of sunset colors, like the Grand Canyon. There was no telltale warning of a huge gap in the earth about to appear. 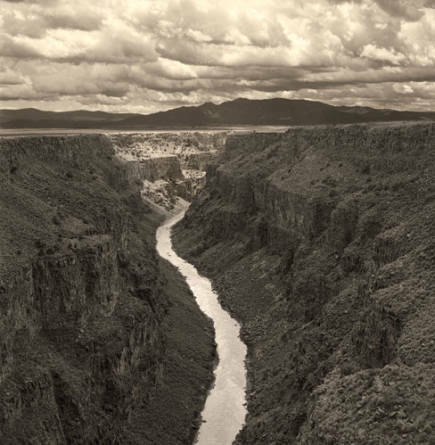 Just the desert ground; then a sharp lip of rock; then a free fall all the way down to the blue Río Grande, snaking its way through the painted canyon that is the Taos Gorge—or, more aptly, the Taos Rift. Taos feels like a rare place, and it is. Most canyons are formed by water tracing the same ground over eons, eventually carving a deep crevice or valley. But the earth that forms the Taos Gorge literally split open into a deep chasm millions of years ago, in a gradual but powerful tectonic shift. Over time, water found the gorge, which guided the shape of the river. Those massive cliffs are like two open palms collecting rain. A few nights later, afterimages of the rift bloomed in my dreams. I woke near midnight, hiked down the canyon, and spent the night there. I didn’t sleep. I lay awake, mesmerized by the stars brimming the valley walls. Last summer, I was invited to New Mexico to give readings at bookstores and teach writing classes. And so, a few decades after that first visit, I crossed into New Mexico again, this time driving a Subaru. Back in my 20s, I’d visited the place on a whim and ended up staying for three years. This time, my trip was planned: I had work in Albuquerque, Santa Fe, and Taos; friends had offered me home-cooked meals along the way; and I hoped to spot a roadrunner. Yeah, I’d become that person: a middle-aged birder driving a sensible vehicle. I didn’t expect anything as stunning as my first visit. But something pinched my gut when I took an unplanned turn toward the Las Vegas National Wildlife Refuge, outside Las Vegas, New Mexico. It was July 4, 100 degrees, and on the shoulder of the road sat a buxom, vintage-yellow, shovelhead Harley. Shading my eyes from the chrome glare coming off that machine, I looked out across the desert: no one in sight. I parked my car and held my hands low over the bike’s engine. It was cool; no one had driven it for hours. I can’t explain it, but big as that Harley was, it slipped under my skin. The New Mexican desert has always had a way of clearing my heart and mind. When I was younger, that clarity opened me up to the possibilities ahead. This time, the fears and inhibitions I’d collected with age started tumbling out of my brain. How long had it been since I’d walked an unknown trail and spent the night alone under shivering stars? I wanted some massive geologic shift to crack open my chest. I wanted my rib cage to split and wild rivers to snake through my solar plexus. I wanted something to make me feel on edge again, to pose some kind of palpable danger. The craving gnawed at me. My life had become so safe. I finished my gigs in Albuquerque and Santa Fe, then arrived at Fort Bergwin, seven miles south of Taos, for my next job. When I checked into my room, I was warned that a cougar had been visiting campus regularly, and that the “Officer’s Quarters” (my room) was haunted. Fort Bergwin was first inhabited (ca. AD 1000) by the Pot Creek Pueblo Nation, then by Spanish colonizers, and then used as a cantonment by the U.S. Cavalry. Though I don’t believe in ghosts, if any land was haunted, I figured this was it. But I slept soundly through the night, and a gentle light angling through my window woke me. At dawn—prime time for wild cats—I hiked up the peak behind Fort Bergwin. If a lion was nearby, it never showed itself. It’s not that I wanted to be reckless. But some sort of vividness that came with youthful risk had dulled in me. I wanted it back. When I moved from Fort Bergwin to the Adobe and Pines Inn, any chance I had at roughing it was completely doused. This place was sheer luxury. I started my day with an exquisite three-course meal, and returned “home” every evening to a private hot tub under stars so content they never shivered. They just twinkled and gleamed in a sky that blanketed night as if the whole world were a sleeping baby. This is the part of the story where I’d like to tell you I’d had enough. That I tore out of that hot tub, ran wild up to the highway in my spa robe and slippers, and hitched a ride on a shovelhead Harley headed west, toward my carefree youth. I want to tell you that my legs were still damp when I straddled the leather seat, that I hugged the belly of the driver (a complete stranger), tilted my head back, and felt the night air whip through my hot-tub–soaked hair. Instead, what happened was this: The one I love (and have loved for a quarter century) drove down from Colorado, and we had a sweet little vacation together. We shared dinners at Graham’s, the Dragonfly, and the Love Apple. We lingered over appetizers, wine, and dessert. All this food took me back to one of my most daring nights on this trip. Just before I arrived in Taos, friends in Santa Fe had prepared an exquisite Catalonian dinner for me. We drank traditional Spanish wine from a porrón—a handheld pitcher with a long, skinny spout—and the act required a poncho for my safety. Maybe it was something about the poncho that brought me back to my first visit to Taos, in the rain, or maybe it was just the sheer glory of that dinner; but that’s when I first noticed the incipient crack in my chest, the beginnings of that huge tectonic shift I’d longed for—and it looked a lot different than I’d anticipated. I have a life-long partner I love now, friends who make dinner for me and offer me rooms with private hot tubs; other friends who shoot iPhone footage of roadrunners and send them my way, because I never did spot one. We, my friends and I, break bread and share wine and stories till all hours of the night, when the stars come out and soak up the light of our youth and reflect it back to us in ways we’d never imagined our lives would look. All this damned love. It’s the culprit. It’s what made me retreat from the easy risks—rock climbing, white-water kayaking, riding a motorcycle open-throttle in the rain—in exchange for something scarier: growing attached, loving fiercely, and accepting the eventual loss that is tangled with that love.